Vermonters are serious about their pancakes! We live in the maple syrup capital of America, which means that even when we’re backpacking, we’ve got a stash of real maple in the bag. We enjoy it in tea, on granola, and in desserts, but there’s still nothing like pancakes for indulging in the maple love. 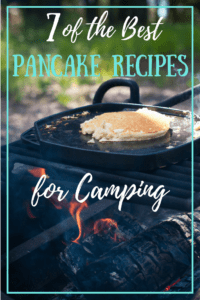 To celebrate spring, and the fact that our maple sugaring season is just about over, I’m going to share our favorite camping pancake recipes with you. They all start with the same basic camping pancake mix, but every recipe is different and amazing. Am I advocating that you eat camp pancakes for breakfast every day for a week? Why, yes I am. You can work off those extra calories on the trail. 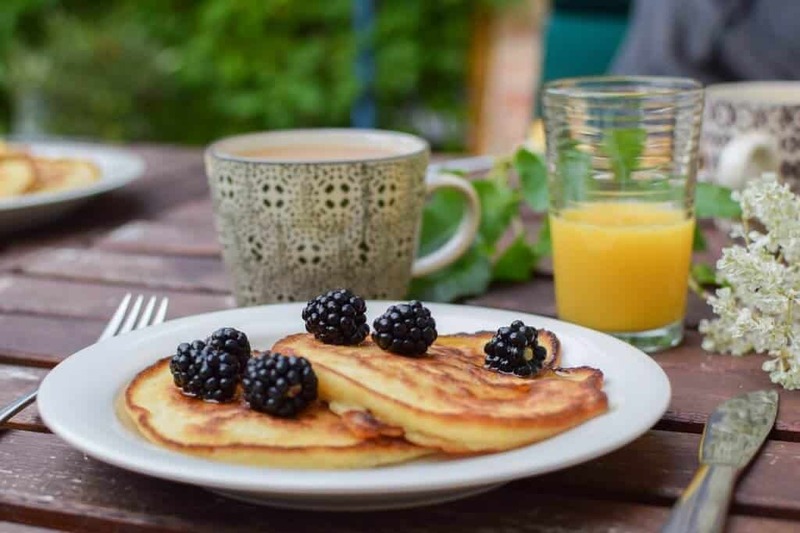 Has anyone else ever noticed that pancakes taste twice as good when eaten outdoors? 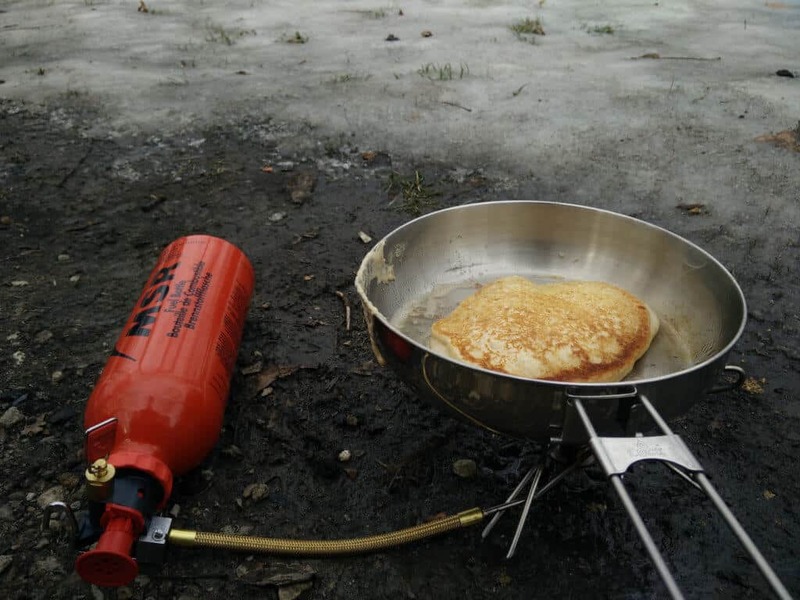 It’s the weirdest thing – I don’t think my cooking methods change all that much when we’re camping, but our camping pancakes are always better! 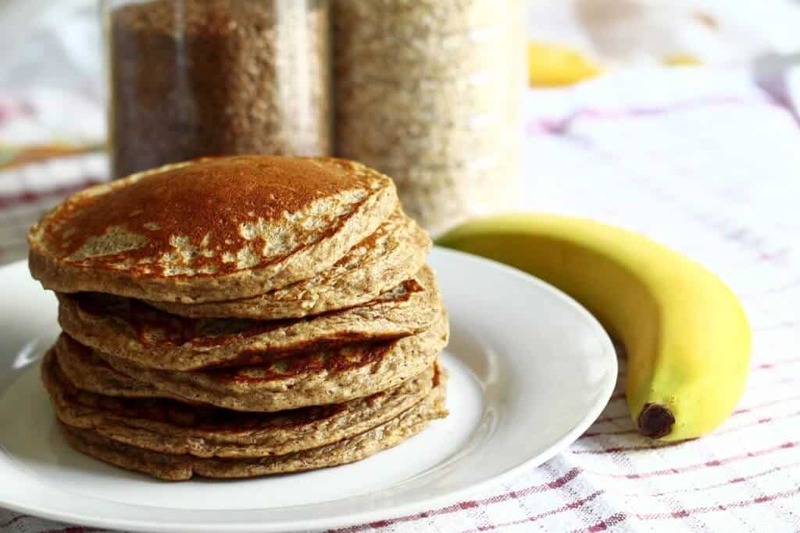 Here’s our recipe for a basic mix camping pancake mix using dried milk powder and a combination of white flour, buckwheat flour, and almond flour. You can double or triple the recipe to suit your needs. If you truly don’t have time to make your own mix, I highly recommend Kodiak Cakes Power Cakes Flapjack and Waffle Mix. Pack your camping pancake mix in a zip-top plastic bag, and don’t forget the maple syrup. This mix is fabulous combined with enough water to make a batter-like consistency. You can add one or two eggs if you have them, and a bit of oil if you want. 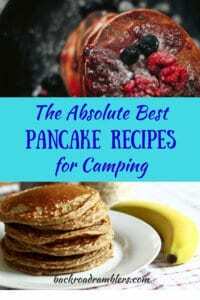 Or you can set your sights a little higher and indulge in the following super awesome camping pancake recipes. All of these recipes should serve a family of four easily (unless you have teenagers, then I recommend doubling everything). At camp: Put your basic camping pancake mix in a bowl and add the cinnamon. In another bowl, soak the raisins in 2 cups of water. Add optional eggs and beat with a mix or fork. Add the wet ingredients to the dry. Fry pancakes in a sizzling hot, oiled pan or iron skillet, and serve with maple syrup. At camp: Mix nuts into the dry ingredients. Combine eggs, liquid, and mashed banana. Add wet to dry and fry in a hot, oiled pan. Serve with maple syrup. If you don’t have maple syrup, these are pretty fabulous topped with peanut butter or Nutella. At camp: Whisk the eggs in a small bowl. Add liquid and chopped apples. Mix spices into the dry ingredients and add to the liquid. Stir just until combined. Fry pancakes in a hot pan greased with oil or butter. Serve with maple syrup. Camping during berry season is pretty awesome. In the northeast, it’s not uncommon to find ripe black caps in June and ripe raspberries, blackberries, and blueberries in July and August. Whole camping trips can be planned around berry season! At camp: Mix dry and wet ingredients separately and then combine them. Fry batter in a hot, greased pan. Serve with maple syrup. This recipe is loosely based on a recipe I found in Country Living. It’s basically dessert for breakfast, so make sure you have a good hiked plan the day you make these. At camp: Whisk the eggs and peanut butter together in a bowl. Add milk and vanilla extract. Stir in pancake mix and chocolate chips. Fry pancakes in a hot, oiled pan. Maple syrup isn’t necessary for these, but if you can’t resist, go for it. At camp: Mix pancake mix with spices. In a separate bowl, whisk the eggs with the molasses and almond milk. Combine wet and dry and mix just until combined. Fry in a super hot, buttered pan, and serve with maple syrup. Saving the best for last. Try these little delicacies and let me know what you think – they’re a new addition to our camp meal repertoire. So new, we’ve yet to photograph them. At camp: Mix basic camping pancake mix with shredded coconut and nutmeg. In a separate bowl, beat the egg and mix with canned pineapple and coconut. Combine wet and dry ingredients. Depending on the moisture content in your canned pineapples, you may need to add a bit more pancake mix to give your batter the right consistency. Fry batter in a hot, buttered pan, and serve with maple syrup. In my opinion, pancakes are one of the best things about camping. I hope these easing camping pancake recipes encourage you to roll out of your sleeping bag each morning to greet the day. 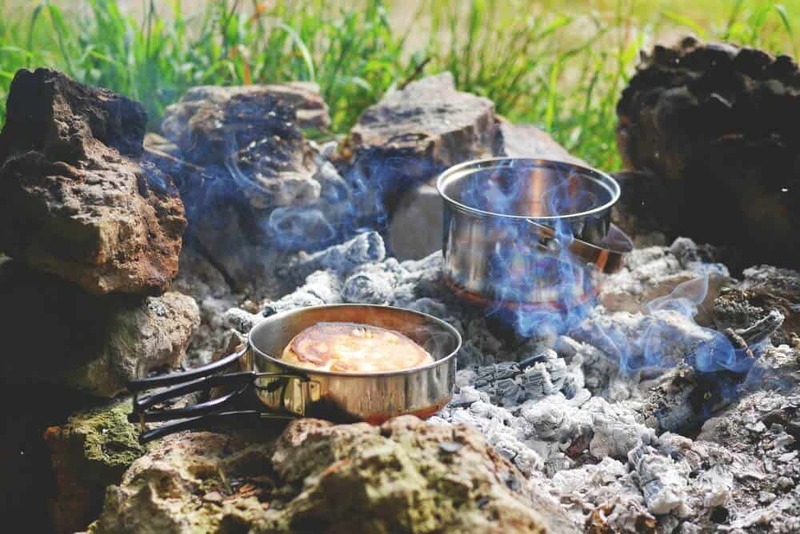 If you have a favorite camp breakfast, I’d love to hear about it in the comments. I just found your blog on Pinterest. I love it. My kids like to take the road less traveled. Now we will have some great pancake recipes the next time we go camping. Thank you!